I wanted to weave a rainbow. The colours were given - the next thing I had to decide was how to plan the transitions. After having played with the simplest of systems ([...a], b, a, b, a, [b...], where "a" is colour 1 and "b" is colour 2), I dug out my old book of math formulas, and decided Pascal's triangle was worth a try. Next decision was how to translate the numbers into yarn. I could think of several ways to do that. Let us take rows number 3 and 4 as examples - row number three looks like: 1,3,3,1. This can be used "as is", i.e. [...a], b, a, a, a, b, b, b, a, [b...] - but that is not any more interesting than the "simple" system above. It needed some more. What if I assigned the positions a "system" in itself, and let the number denote how many times to use this sub-system? If the first position means b,a,a,a; the second b,a,a, the third b,b,a, the fourth a,b,b,b - then row 1,3,3,1 becomes [...a], b, a, a, a, 3(b, a, a), 3(b, b, a), b, b, b, a, [b...]. A bonus with this system is that it can easily be adapted to the width that you want the transition to cover. The third row, this way, uses 26 ends, while the fourth takes 44. Wish a wider transition? Try row 5 (1, 5, 10, 10, 5, 1) - it takes 1(b, a, a, a, a) + 5(b, a, a, a) + 10(b, a, a) + 10(b, b, a) + 5(b, b, b, a) + 1(b, b, b, b, a) = 110 ends. Is that too much? Think up another "subsystem" - how about 1(b, a, a, a) + 5(b, a, a) + 2*10(b, a) + 5(b, b, a) + 1(b, b, b, a) = 78 ends. However. In weaving, we also have a weft and a structure to consider. Let us assume we want a balanced weave, and let us consider two simple structures: plain weave and 2/2 twill. The colour transition in the warp shows clearly. It now can be seen that structure will influence the appearance of the result - will it really look like a colour transition? 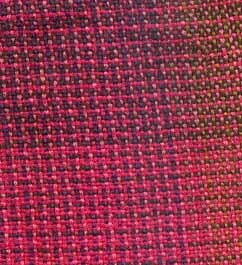 With this warp sequence the choice of structure is more important - the plain weave example can work for fine threads, an object to be seen from a distance, or colours that are not too different. On the two last pages I will show you some theoretical colour transitions, generated in ProWeave, and two examples of my work. 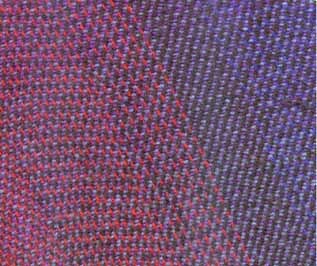 One is a scanning of a portion of a sweater. For this I used a woollen yarn of about 5000 m/kg (ca 2500 ypp), at, I think, 5 epcm (20 epi), and a 2/2 twill. It has a warp ranging from a bluish red trough tomato red and brown to royal blue. The weft goes from a greyish blue to purple and back. 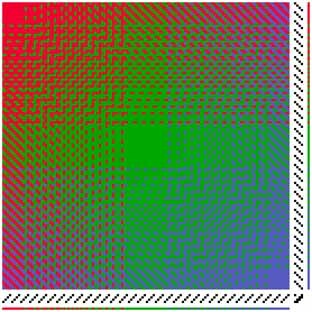 Both warp and weft sequences are based on row 7, interpreted as 1 x (b,a,a,a,a), 6 x (b,a,a,a), 15 x (b,a,a), 20 x (b,a), 15 x (b,b,a), 6 x (b,b,b,a), 1 x (b,b,b,b,a). 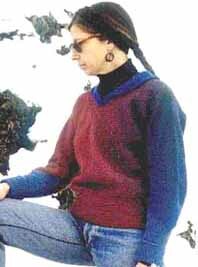 The sweater is cut on the bias - think "poncho" with underarm and side seams. I knitted a collar with one strand royal blue, one strand greyish blue, the sleeve ribbings are greyish blue. The waist welt is knitted in garter stitch and made in two parts - the front of one red, one blue, the back of one blue, one purple strand. The two parts are connected with two blue abalone-buttons on each side. 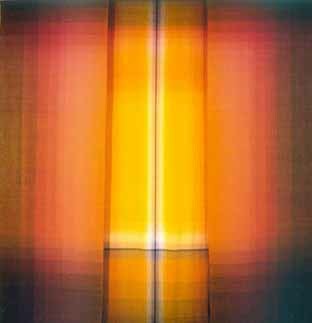 Next is the best my scanner can do of a photograph of a triptych called "Flame". Each panel is 110 x 250 cm (circa 44 x 100 inches), they are mounted with the middle panel about 15 cm (6") back of the two side panels. "Flame" is meant to picture a flame, with the purple-and-white-hot centre about 50 cm from the bottom. It progresses through yellows, oranges to reds and browns at the edge of the flame. It is made of a worsted yarn about 10000 m/kg (ca 5000 ypp), set at 6 epcm (24 epi). I wove it in plain weave, and up close some of the colour-and-weave effects are apparent, but it was meant to be seen from a distance. Nowhere in the warp there are more than 20 ends of the same colour.